Once one is involved in puppetry one never seems to escape! This page is an update for http://www.puppethouse.co.uk with new finds and information. Some have appeared on annperrin.wor dpress.com but It has turned out to more like a scrapbook and got a bit out of hand! Theatre Guild Exhibition at an hotel in Russell Square in the 50s. My father was on the committee and was the event manager. In 2016 I published a book of poetry and prose poetry called ‘The Puppeteer’s Daughter’ it has poems about nature, love and loss, poems about eccecntric people and the complexities of being a Puppeteer’s Daughter. Available from City Books in Hove, Open Art Cafe in Rottingdean, on Lulu and Amazon on line. The whole family but particularly my mother, loved the fact we had recorded the history of our marionettes known as Ron and Joan Field’s Marionette Company. They started very modestly and were rich or poor depending on the sun and the season, but also had the honour of performing for her Majesty the Queen at Buckingham Palace at her first party after the war. Two larger characters had speaking roles. They recently appeared on a BBC South East programme as part of a series commemorating the Great War. 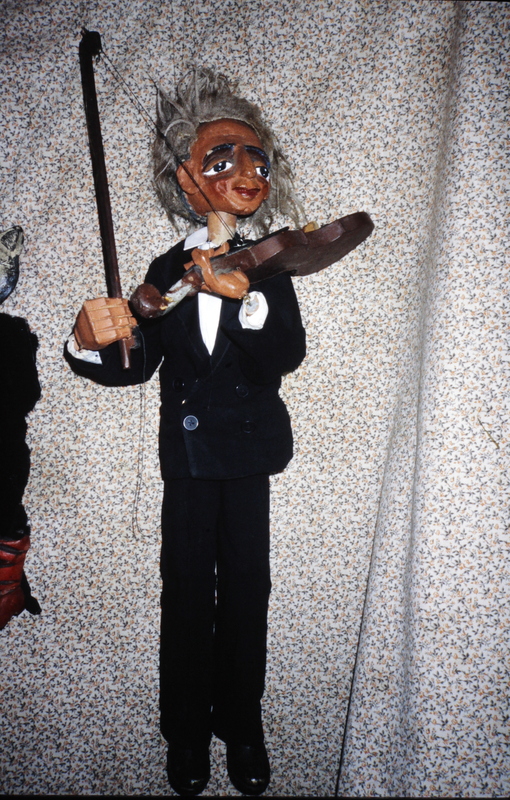 My parents started as marionette makers and performers in 1946. I became part of the team from an early age. However in retirement I am still trying to work my way through archive boxes, full of newspaper cuttings, photographs, articles written by my mother or myself, scripts, letters etc. I born in the middle of an air raid in London in 1940 with a cleft palate, this problem meant it took me several years to speak clearly, so puppetry was a godsend. I could hide behind a wooden doll. In later life I still had problems with pronunciation but developed ways of dealing with it. My formal schooling was limited. At 15 I was running one of our companies on Scarborough’s Spa, my parents where running the other in Blackpool. We met in Harrogate at the weekend to discuss takings! At 18 I was the youngest professional puppeteer in the country travelling in Variety and later in Cabaret. My sister managed to escape such a fate, married and became a teacher for most of her professional life. I married and had two sons but puppetry was still part of my life, first as a primary teacher, then as an art teacher in a secondary school and as part of my career in adult education. As a child I remember taking shows to Selsey and Clacton, huge marionette musicals to Bognor in the 50s and later to Blackpool and Scarborough. Our marionettes performed Cinderella at the Torch Theatre Club in Central London. My parents set up the first static marionette theatre in London with red plush tip up seats purchased from a local cinema. It took up two adjoining rooms in our house on the edge of Highgate. It was open to the public on Sundays. As well as local people, actors and celebrities headed for our house for the latest performance. Soon afterwards The Little Angel Angel Theatre was set up in Islington by a friend of ours John Wright. It became a landmark for puppetry in Britain and is still going strong. Checking newspaper cuttings last year – I discovered at one time my mother and I, both with very different solo cabaret acts, were performing in Variety in theatres at opposite sides of the country the very same week! The following are posts about our puppets from July 2011 all in one place and a few recent diary notes. You have to be an enthusiast to scroll down. Good luck. Our ‘Oh What a Lovely War’ Marionettes on Display to the Public at last! At last, after so many years, where better for our marionettes from the 60s film ‘Oh What a Lovely War’ to be on display than at The Grange Art Gallery and Museum in Rottingdean as part of their ‘Cinema by the Sea’ exhibition, the brainwave of Marcus Bradshaw the curator. He has a passion for his curating and this time has been intent on gathering artifacts from iconic films of the 50s including ‘Genevieve’ and ‘Chitty Chitty Bang Bang’ others, all films shot on location on the South Coast. ‘Oh What a Lovely War is out of storage and I am about to work out the display for the Grange.Found hundreds of Slides Tom Hardwick cleaned and copied for me months ago. Some brilliant puppet ones among them. July 2015 Jamie is back from three months in Japan and is going to show me how to edit on Studio. I really love Adobe 6.5. it is so intuitive but needs must to get things on to youtube. The puppets are now in storage instead of all round the place. I actually miss them! Just in time for Christmas managed to edit Frosty. Jamie and I made this film in May. I have had some time out being poorly and then had to learn new edit system (not yet up to scratch) but here it is! This will be the first day of getting our on-line marionette museum on the road. One of my grandsons is going to have a work experience morning with me. 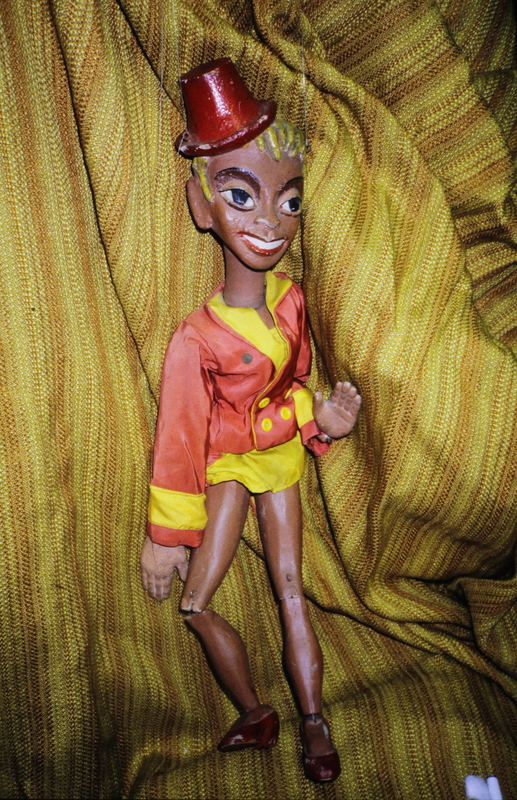 We have already checked out the 78 records we used and found two of the original marionettes Carmen Miranda and mademoiselle de Paree so Jamie and I will start filming this week! Bitter sweet BBC South East last night. Posted April 30th 2014 on annperrin.wordpress.com. So there it was – the long a waited showing of the original version of ‘Oh! What a Lovely War’ on 35 mm at the Duke of York’s. A message in the programme from Michael Attenborough, The warm and wonderful Robin Gibson compering, a special welcome from Polly Evans, BBC South East. There were songs from the film by BIMM a choir dressed in uniform, a panel consisting of Richard Attenborough’s daughter, Charlotte, who played ‘the little smith girl’ in the film, with the immortal line “Granny what did Daddy do in the war?” Angela Thorne, who played a young nurse who sees five members of her family off to France never to return. She talked about ‘the lessons of war never learned’ and her own family’s reaction to seeing the film and also the wonderful atmosphere on the set, being looked after, staying in lovely hotels, the hospitality. Haley Mills told of her father’s pride in being in the film. 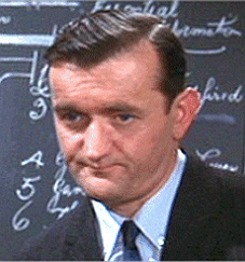 Maurice Roeves who played George Smith, said he regarded most of it as a great job for a young actor. He’d had a whale of a time, but also had plenty to say about the futility of war. Throughout the proceedings the marionettes stood stage right and there was a complimentary drink on the house for all. But at the end of the day it was the film. How brilliantly conceived it all was and how sad bringing back, as it did once again the politics, the infighting, the class divisions, the sheer futility of it all. Although I know there are still rumblings in high places even today that this was not the case. I was supposed to be on a mini break in France but cancelled to attend the event, because I was so glad of an opportunity to take my own sons, daughters-in-law and my grandchildren to the film. It was also a chance to celebrate their grandparents achievement in making and performing with marionettes, the latter included me! This film was more or less the last time we worked as a family. Most people think of puppets as toys but I can assure you most directors including Richard Attenborough regarded them as actors in miniature. So many local people who were extras in the 60s had personal reasons for volunteering to take part in the film. Last week Barbara a friend who used to live in Woodingdean said she remembered all the crosses on the downs and how moving that was. So as well as celebrating a masterpiece by Sir Richard Attenborough, it was a moving evening, not least for some wonderful conversations with other older ladies, all of whom had memories of grandfathers who had fought on the Somme. One told me of her efforts to trace her loved one’s service history at Kew, something I have done myself. My own grandfather was gassed and suffered shell shock, but he did come home. This film is like watching shadows from one’s past. Watching our own smaller soldiers playing their parts, I could not help thinking about how, on set, Richard Attenborough, suddenly realising there was no actor voice for one of the soldiers, took the role himself to interact with the actor Jean-Paul Cassel much to everyone’s amusement. Seeing Kenneth More in his German helmet again, I suddenly recalled him as he was a few years earlier sitting in his lounge with the children enjoying characters from the Mad Hatter’s Tea Party and clowns from our Puppet Circus. How on earth these incongruous things slip into one’s mind I don’t know. So thank you South East Today for a lovely evening. There are 8 more tiny soldiers and a white plaster horse from the roundabout in storage. My eldest son Robin (Robin Perrin) met someone at the event who had worked on the set with the roundabout. I would love to hear from him or anyone else with behind scene puppet memories from the film. Museum update. The Imperial War Museum were hoping to have the marionettes but currently have too many demands on their space! 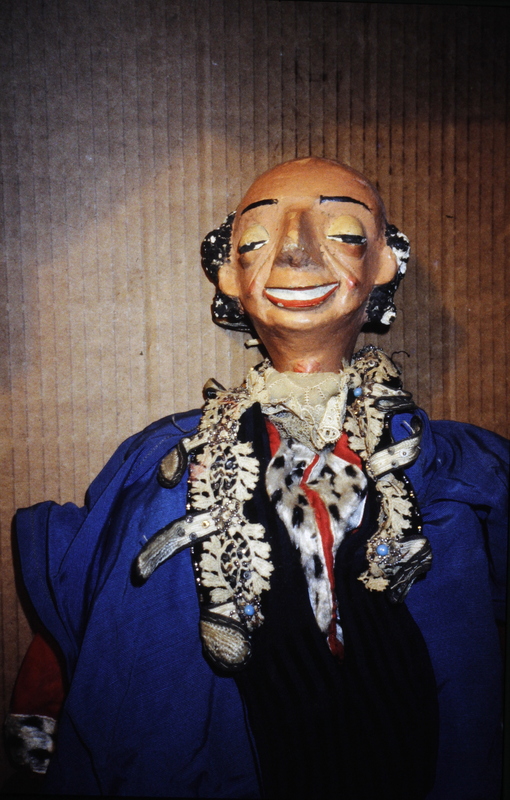 Anyway enough posting about puppetry for the moment, they will go back into storage, but the V and A Theatre Museum have also shown interest in some of our marionette collection and there is still Brighton Museum. Who knows – Serious enquiries welcomed. Associated blogs – the filming in Dec.
Out of storage they came, the marionettes from the ‘Oh What a Lovely War’ feature film and their conservation is now more or less completed. 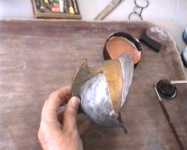 Some of the soldiers helmets needed a few pieces of horse hair which is an essential part. Luckily my friend Maggie who has a horse called Prophet provided it. Some of the armour had been broken so I had to piece it together again and/or make leather replacements. The main characters had to be re-strung which takes forever, but I think they looked pretty good by the end of the conservation process. Paul, my youngest son tooled some of the leather work, Alan, my partner cut guns to replace those that were missing and Robin my eldest son contacted the Imperial Museum, who immediately said they would love to have them for a future exhibition about remembering the Great War. 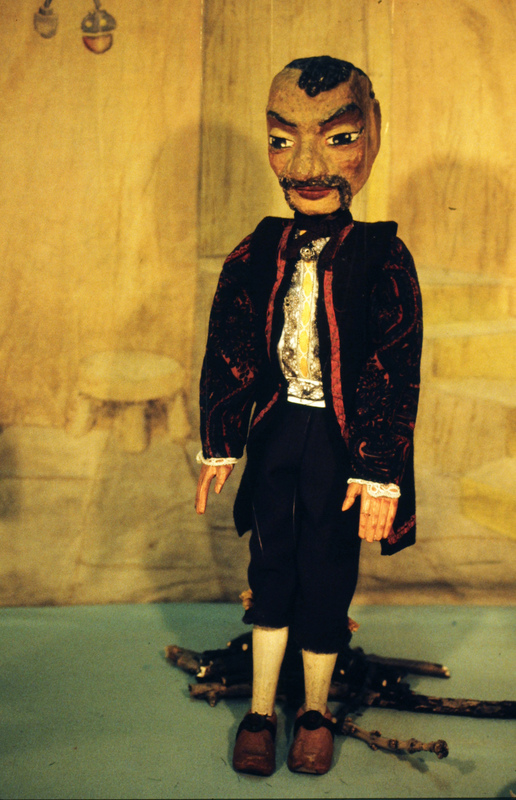 There is also a heritage lottery fund bid in the pipeline for an exhibition in Brighton about the making of the film and we have been approached to display the marionettes there too. Today the BBC have been along to film some of the conservation process. This will be used in one of their films on the Great War. Lovely interviewer Robin Gibson and a super duper cameraman, and me looking fifty years older than I was when I was on that pier operating the marionettes. Depressing she said being vain! I won’t talk about anecdotes relating to ‘Oh What a Lovely War’ today, but trust some of them will be included when they show piece on TV. They came, they saw and we conquered today. Of course Britain and it’s allies won the real war, in which my grandfather also played his part. He was shell shocked and gassed and I never forget his night time coughing. Our marionette studio was in my Grandparents’ house in Highgate. I wrote a poem called ‘Grandpa’s War’ about his wartime experiences currently in a pamphlet called ‘The Puppeteer’s Daughter’ being considered by a publisher currently. So now the soldiers will go back into storage until they get their final call to arms. I will be guest of honour at the Telegoons 50th Anniversary next Saturday. (several Telegoon posts on main blog) I was known as the Telegoon girl! But this is about my first encounter with Graham Stark. Graham Stark once stood in for Spike Milligan in a Goon Show episode and was friend and fellow actor with Peter Sellars. Graham sometimes attended ‘The Goon Show Preservation Society’ events. Graham Stark was also top of the bill at Eastbourne Hippodrome when I was 16 and with a partner doing a marionette cabaret in the show. As I was so young my mother had insisted I stay with an ancient Aunt in Eastbourne for the season. The very first week I got trapped in the creaky old lift in auntie’s block of flats all night, until the milkman rescued me in the morning. Auntie was not amused and accused me of ‘being no better than I should be’ and showed me the door! On telling my fellow artists the sorry tale, Graham Stark suggested I dye my hair blonde and to hell with Auntie’s dire predictions. A gullible teenager, I emerged from the hairdresser next day a peroxide blonde. When my mother saw it, she insisted I dye it back to my original colour at which point it turned bright green! I blame any fall from grace on Graham Stark! 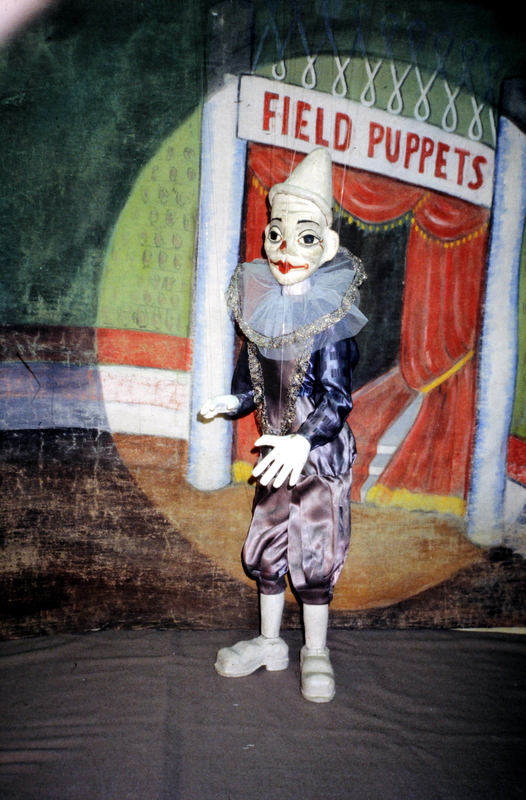 From the 60′s The making of the puppets took several months and they were all loaned for the filming. In cases like this we were always careful to keep the rights to our characters. This was the last time that the whole family worked together on a project. 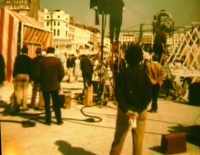 We were all involved in the shooting of the film on Brighton’s West Pier and Richard Attenborough directed the marionettes as though they were real actors. June 2013 – A celebration of the life of Charles Chilton at the BBC. It was an honour to be on the guest list for ‘A Celebration of the life and work of Charles Chilton’ at the BBC. His family had included us because I had been one of the puppeteers for ‘The Telegoons’, so naturally we dressed up a bit for the occasion! Penny Chilton full of smiles and humour as always, was there with her family to greet us all. “How the BBC has changed” she remarked looking round, “so very different from my day”. She had of course been a shorthand typist in the BBC when she first met Charles. We met Charles for the last time in 2012 when he unveiled a plaque in honour of ‘The Goons’ and today John Repsh of ‘The Goon Show Preservation Society’ is on the list of speakers. ‘ Charles, the plague and John Repsh. Once we were all gathered in the Radio Theatre, Jon Briggs apologised profusely for not being Alan Dedicoat as the programme stated. I’ve no idea who Alan is but no one could have done a better job than Jon. He told us that Charles had regarded the BBC as his university, musical college etc. where he learned all the skills he had ever needed. Various extracts from Charles talking about his life were played which added poignancy to this lovely occasion. Michael Pointon, Writer and Broadcaster talked about Early Jazz at the BBC and told us about Charles starting the ‘Radio Rhythm Club’ and later writing ‘The Story of New Orleans’. He was a pioneer in this and in fact most things that he did on the airwaves. Stephen Winders, a member of ‘The Eagle Society’, brought to life Charles’ interest in and recordings and stories about the wild west. Charles had researched the wild west and all his stories were based on fact including the music and drama written for the BBC. Later the stories were extended to books, comics and merchandising. Next on the programme came Professor Colin Pillinger CBE – Charles he said had researched space and met Patrick Moore, among others, and also bought an astronomical telescope before he launched into writing ‘Journey into Space’ because he wanted his stories to be based on fact. Colin had met Charles a few times when he was quite old. He told of an occasion when a team of people were lined up ready to meet Prince Andrew and Charles and Penny burst through the door, which was only supposed to be used by the Prince, much to the amusement of all concerned. John Repsh was keen to talk about Charles’ involvement in ‘The Goons’. Apparently he was instrumental in keeping the peace between the main players, particularly when Peter Sellars was worried about being typecast and wanted to leave. It took all of Charles’ ingenuity to keep the show on the road for just that bit longer. Roy Hudd OBE – comedian, actor, radio host, music hall maniac, was on hand to tell us that Charles had been one of his main inspirations and that he regarded him as his university, musical college etc. Both he and Charles had been brought up by their Grandmothers in London and risen to fame (and let’s hope fortune) from humble beginnings in London. This is Murray Melvin – an original cast member in the play ‘Oh What a Lovely War!’ now archivist at the Theatre Royal, Stratford East. I think we all found his talk particularly touching. He told of Charles visiting Arra s as a young man to find his father’s grave and being shocked to discover over 35,000 soldiers, including his dad, had no known grave. This event led to Charles doing the research that led to ‘A long long trail a-winding’ and then ‘Oh What a Lovely War’. Bertrand Russell had been invited to the show on his 90th birthday. Murray then read out the text of a letter which Russell had sent afterwards to each member of the cast telling them how touched he had been by the show and how he hoped that it’s anti-war message would be transmitted throughout the world. Bertrand Russell was a pacifist and had suffered dreadful prejudice and attacks when talking about the folly of it all on a soap box in Hyde Park. The original play is going to be back in Stratford next year as part of the anniversary of the outbreak of the Great War. Gillian Reynolds MBE. Radio Critic, The Daily Telegraph. We all warmed to her, a lady of long experience with the BBC. I agreed with her general dismissal of TV, radio is the medium to entertain, inform etc. Charles originally approached the reception desk at Broadcasting House and asked for a job. He was told no one walks into the BBC with such a request. Luckily for him as he left the senior commissionaire saw him took him to one side and told him to write to the BBC, which he did. The rest is history. Gillian told us he had time too he had brought new people to the BBC and nurtured new talent. That the work of Charles Chilton was a continuing inspiration. Where she asked where would we be now without his influence, his originality, his creativity and his ability to communicate? With a summing up from our able master of ceremonies we adjourned to the Media Cafe for refreshments with friends and family. Looking round that room at the buffet, it was a happy but gentle celebration, family, friends and quite a lot of ‘old timers’ from the world of entertainment, people like Charles himself ‘the salt of the earth’. I had a chat with Roy Hudd. He is older than me and very famous, while I have only ever been on the fringe of show busines but we shared a few memories of Variety. We had both appeared on the same bill with the legendary Max Miller early in our careers. Congratulating Murray on his contribution, I mentioned our involvement with the film, (I was once told that Charles was not happy about it and did not full credit for the original concept) but I’ve still got the marionettes from the film and was hoping that ‘The Imperial War Museum’ might be interested in them for next year when they commemorate the outbreak of the Great War. Murray thought they might well be. 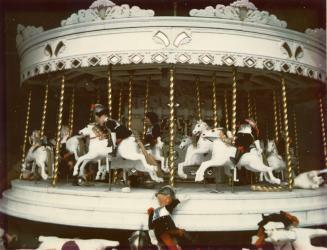 Our marionettes, the set and roundabout from the film. We don’t have the roundabout but we have all the little soldiers. Our Eccles was exhausted with all Ann’s name dropping! It’s back to the gardening tomorrow but what a wonderful wonderful day! April 2013 The second Telegoon film episode on our youtube site check it out for the rest. Been poorly for a while – nothing serious but debilitating, but still cobbled together a film using adorable miniature hats in the loft. Same week Paul did some funny improvisations with his Mr. Punch. Just take a look at Judy’s Easter bonnet! They say it’s never too late? Well perhaps 50 years is pushing it a bit! But the films on this post have never had a public viewing, except for the characters pictured above. They together with their satirical scripts, had a weekly following on Granada TV! But it was all a far cry from the hopes and dreams we had for it all the 60s! It’s New Years Eve! So it seemed like a good idea for the end of 2012 to tie up a few loose ends, especially as they are part of our family history. I’ve got to grips with transferring videos to DVD. This first one about gnomes in a garden was a pilot for the BBC. 1. Wrote 6 scripts. 2. 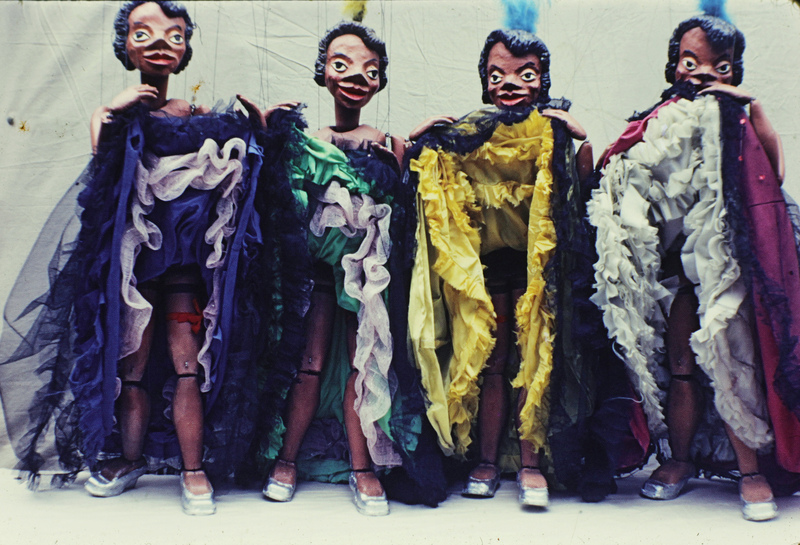 Designed and made the marionettes, 3 Dressed and strung them – all in between ’live shows’ in order to earn a living! 4. Wrote musical score, employed musicians – recorded script 5. Collaborated with others – raised money to hire additional film editing expertise. 6. Found an empty garage/storage unit – laid a level concrete floor. (We did this ourselves – so I think there could still be an abandoned mini mountain of concrete somewhere in North London) 7. Bought a camera, ordered the film. 9. Hired a crew, started filming. 9. Watched the ‘rushes’ every day to check continuity etc. 10. Edited film. We took the film to interested parties at the BBC who wanted to see more, by which time we were relying on others for editing etc and we simply ran out of time and money. Frankly it was partly a question of ‘who you knew’ and you certainly needed lot of money to back your own projects. Oh! and the series was written to appeal to under fives and we did all the voices ourselves. ….and yes we were all as mad as Hatter’s to even attempt it! In the puppet business it was always important to move with the times. My father invented a method for synchronising the lip movements of marionettes. I have just transferred an early trial, a fun attempt at making a commercial. (Please press arrow to see it.) 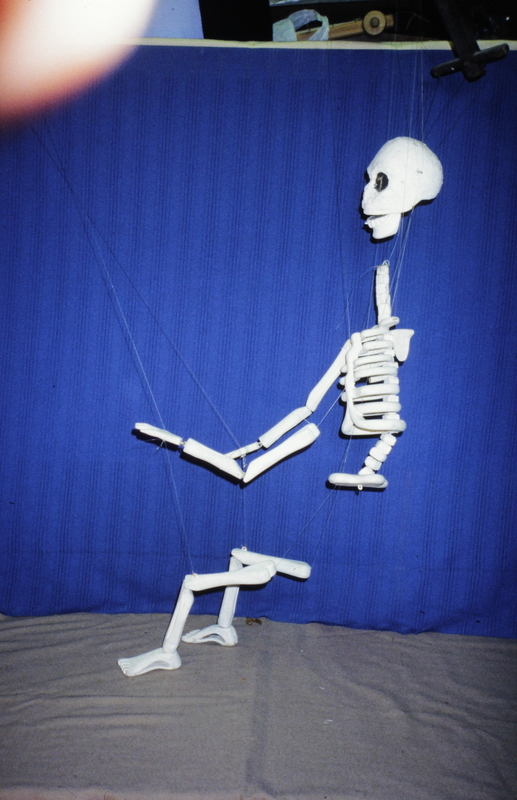 We later improved the sync system, but companies however still employed us to make more conventional marionettes for their commercials, such as Lucas and Pye Radio. 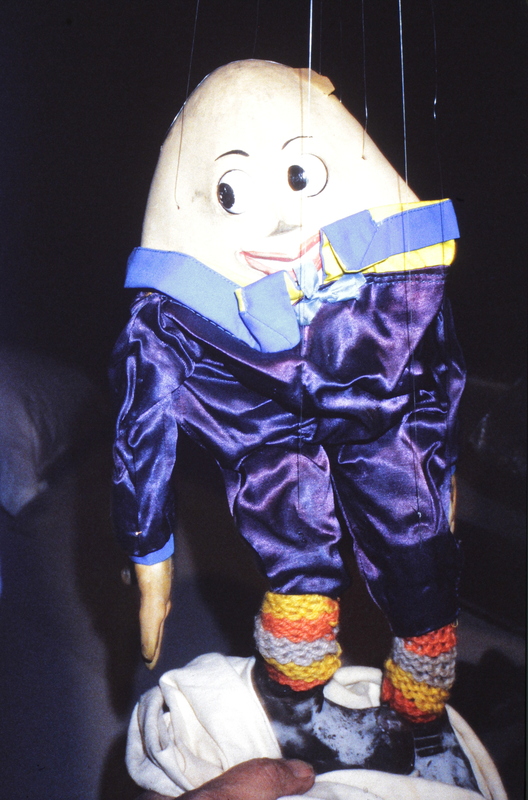 My father’s lip sync puppet technology was also used for early episodes of The Telegoons, he had patented the invention, but in the end I believe the film company did their own thing ‘in house’. My parents spent a fortune on legal advice. We had lots of visits to our studio and had been approached to make the puppets, I still have the original designs for each of the characters (I will put on youtube when I get round to it) But again I believe the film company decided to make them ‘in house’ to save money! Big mistake, the Telegoon latex heads have disintegrated, while our rubber headed gnomes and clowns remain to this day! But some of the rubber boots and rubber hands were made in our studio – subsequently several of our own marionettes wore what we liked to call. ‘Eccles boots’. Our family were however the only puppeteers involved in the pilot of the Telegoons which sold the whole thing to the BBC. No one can take that honour away from us! I was engaged as a puppeteer for 15 episodes and as I was already a member of Equity this ensured that I could do ‘puppet television’ work. Later there were arguments as to which union subsequent puppeteers had to join. The whole process was so full of intrigue behind the scenes that it was a wonder the series actually got made! because he was in so many inscenes. But I also operated Eccles, Blue bottle and others. The Goons had mixed feelings out it all but Spike however did visit the set once! The series was not very popular in this country but became a hit in Australia, especially for a generation that had never experienced the joys of the original radio series. Very soon other lovely puppeteers were brought in, Violet Philpot and John Dudley to name two. Years later John enjoyed reminding me that we met in ‘dustbins which was true. He walked on to the set, and took his place next to me, where I was already manipulating Neddie in a dustbin! I made this Eccles myself, I was taught to carve hands by one of the leading wood carver at St Paul’ s Cathedral (in his garden shed) Tony Webb, he lived round the corner from me in South London! Not all our puppet hands were carved and my father never that time to teach me anyway! Granada TV- Before The Telegoons came about we did a satirical series for Granada TV. writing new scripts on a weekly basis. The puppets have got lost but the sound tape with the first script, played just long enough on a friend’s reel to reel tape recorder to capture it on a cd before it ‘gave up the ghost’. Their are one or two gaps and quality is not always brilliant but come on folks, it’s the effort that counts! This episode it about giving up smoking and typical of my dad, in that he did not want anyone telling him what to do and what not to do! I believe my parents were pioneers in the precarious world of puppetry. As well as theatre, and TV they did hundreds of Road Safety shows in London Schools linking the serious safety message with the fun of the clowns in the circus. On one noticeable occasion my parents their shows to Buckingham Palace to entertain the Queen, Prince Charles and Princess Anne at a private party. However I can remember entertaining the stars such as Peter Sellers, Lauren Bacall, and Humphrey Lyttleton in London hotels such as the Dorchester. My job was helping with the scenery and pulling the curtains until I was old enough to pull some strings! The show usually included the Puppet Circus, The Teddy Bears picnic, musical numbers, extracts from Alice in Wonderland. or Peter Pan. I am still hoping to get our collection of 200 marionettes into a museum or one of the Stately Homes in which we performed. The Imperial War museum are interested in marionettes from ‘Oh What a Lovely War’ but can not guarantee to show them in my life time. So in the meantime this set are in The Grange Art Gallery and Museum in Rottingdean. I was hoping to do some more films with Cindy….for youtube. She was to interview our marionettes about their lives and performances. but she was just too vain, messing about with her hair instead of rehearsing her lines. Dec 2012 – Found some more old sound tapes, one was of my parents Road Safety Show in the 60’s…whew so tiring, but feel obliged to carry on! Will add to a post at a later date. Dec 2012 -Frosty the Snowman has been on the main site for about four days and has had about 400 visitors not bad for an ageing snowman! Click on link below to see him. Mr Punch pops up to town! We’ve just made a five minute film called Mr Punch pops up to town. The full documentary of The Big Grin has more material but it does last about 25 minutes, so this is a quicky! Eccles our look-a-like puppet grows his own! Eccles sends greetings to all the other ‘look-a-like Goons’, who he believes were busy performing The Last Ever Goon Script outside the Strutton Arms yesterday! He felt far too tired to go up to town, so in the absence of a BBC limo to drive him up in style, he insisted on singing the Ying Tong song (extremely badly) on his allotment on The Weald, while planting his new crops, with surprising results! Now he’s got the ‘grow your own bug’ and there’s no stopping him. Eccles can only hope they recorded the jollity up in town on their old box brownies and/or their ancient wind up black and white cine cameras, so he can view it all at his leisure, on his super duper blackberry, or was it raspberry, the one he is hoping to buy with his ill gotten gains. Ok, so little things please little minds! It was a bit a matter of divided loyalties today! Should I stay in the make the boots I’d promised a disgruntled gnome, the one in blue of the left? Go to the allotment in the rain to plant my garlic? Or just pop up to London to listen to some award winning poets? Umm no prizes for the right answer! An old mechanical Pelham Puppet display! Just look at that – so intricate! This is Bimbo the clown, always a favourite in Pelham Puppetland. A few years ago I had a limited number reprinted, mainly to please my mother who had written the first book. We also made a dvd of all the plays, admittedly the ‘boy meets girl’ scenes are a bit dated, but it was the 50s. I still sell a few on Ebay when the mood takes me, even though the dvd is the older format and not wide screen, Some people probably remember the puppets from their childhood. I had the even scarcer second book reprinted that my mother and I wrote together, but I have not got round the editing the film. Life is just too short and now off to do a bit of planting while the sun shines! Film lasts less than a minute! Whoops! Forgot to say the wooden speaker has nothing to do the display – sound is AKM copyrite free. Those were the days! We had blocks made, printed our own leaflets, programmes etc. There was something special about all the paraphenalia that went into our little ‘print shop’ as we called it! ‘Dismantling the Print Shop’ is without doubt my favourite post, goodness knows why? The Jubilee celebrations made me think of this picture. This display was prepared for the windows of our house in Dartmouth Park Hill in North London for the coronation in 1952. My parents went of to perform at many of our stately homes. occupied at the time by their owners, not the National Trust. They also entertained The Queen at Buckingham a few years later at a family party. They put on elaborate marionette musicals for thousands of members of the public during summer seasons in holiday resorts. Many, many children in London saw their shows which were part of London’s road safety campaigns at the time. The highlight of their career in the puppetry world, and mine, was to make and perform with the marionettes that were part of the feature film ‘Oh What a Lovely War’ on Brighton’s West Pier in the 60s. Film edited at last! Mr Punch’s 350th Birthday Party. More on ‘The Big Grin’ This film has been a bit of marathon, I had about an hour and half of footage. I wanted to make sure that every Mr Punch who had made the effort to attend was in the film. Some of it required quite a lot of editing as I was whizzing round without a tripod, filming much of it with my camera above my head. It has ended up being a compromise between quantity and quality, with some stills in it to keep the show on the road! I edit in Adobe 6.5 transfer it to Movie Maker and then download on to Youtube so the process takes forever. Eventually I said enough is enough and put it up! Hope all you fond followers like it! Our family were marionette makers and performers. No one reading this blog could have missed the point, but the story has many aspects and grow and grows. So … in the old days everyone knew everyone else so we knew the original Percy Press who was famous for his performances in Covent Garden as was his son Percy Press Junior. Whatever you think about Mr. Punch and lots of people don’t like him or approve of his antics, he was very much part of the old seaside tradition. Some Punch and Judy men barely made a living, the work in the old days was seasonal and the takings relied on a ‘bottler’ the person who went round with a bottle to collect the money for the show before the audience slipped away without bothering to pay! Later the ‘bottler’ would use a hat for the money. These days many Punch men command a fee for their show so the bottling bit is the icing on the cake! I can’t help smiling when Punch and Judy men claim to be the original Punch and Judy man from this or that town. There was always more than one, striving to keep their status and the beach! Now there are schools to teach the art, no doubt awarding diplomas, but that is only the beginning, a Punch and Judy performer will still have to spend years developing his skills. Success in this business depends on whether one can actually made a living as a Punch and |Judy man, or woman, or indeed a marionette maker and performer. As a daughter of puppeteers despite our successes, it was a very insecure life. I used to say we were rich or poor depending on the sun and the season! I have in the past sometimes envied puppeteers who have been subsidised by grants from public funding for the arts. My father prided himself in never accepting a penny from such funds! Our marionettes are of course works of art, (as many Mr Punch puppets are). My father who created most of them, had their character and its movement developing in his mind as he made them. This was why he never made marionettes for anyone else. Although I remember he once broke this self imposed rule, to make copies of two or our marionettes for a theatre company in Windsor. Even our marionettes for the feature film ‘ Oh A Lovely War’ on Brighton’s West Pier, were not for sale, but dressed, played their part and came home, and, like real actors, paid their rightful fee! April 23rd – Punch and Judy’s wedding day for their 300th Anniversary. Preparation. Booth, Judy doll, thread, two controls, scissors, enthusiasm. Dialogue (prior to the event – not that of Mr Punch who was nowhere to be seen). This is the nature of creativity- ideas evolve and connect in one’s mind and suddenly one feels compelled to run with them. The day of the shoot (technical word for filming) Alan was playing his fiddle and the real Punch and Judy Professor in the family, my youngest son Paul, had come over to play duets, so I knew I couldn’t disturb them. So it was Punch and Judy celebrating their ill fated wedding in the garden. The only witness to the proceedings me and my camera. No wonder Punch was not impressed! Comedy… a bit like life, a lottery! her posh wedding veil and finally in all her glory! I bought a very old piece of music from ebay with this title. Unfortunately when it arrived the piece was so complex no-one could play it. Here on the right. On Wednesday a friend forwarded me a clip called ‘Puppets in the Attic’ – it was all about a film company who were trying to raise funds to archive the work of ’The Mumford Marionettes’ and the clip had been shown on TV on Monday. 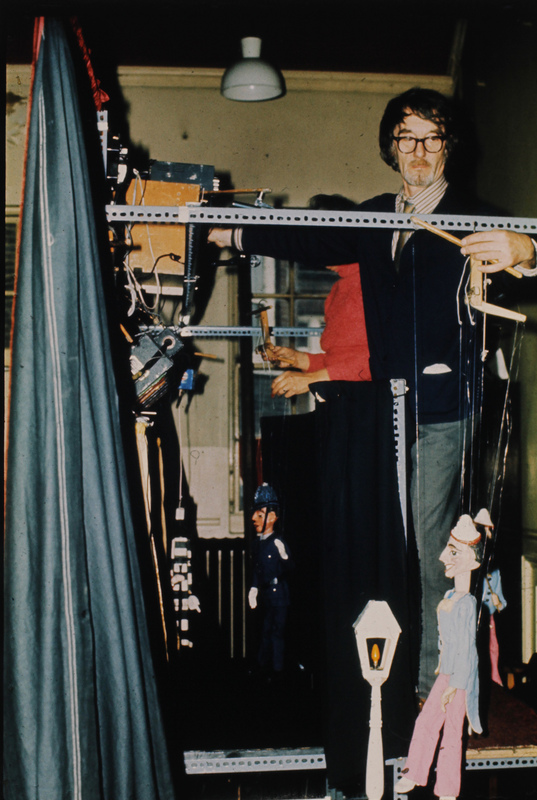 ‘Puppets in the Attic’ showed Fred Mumford, a cheerful 90 year old puppeteer, with his marionettes. It transpired that most of the collection is currently stored in his loft, together with historical film clips of Frank and his wife Maisie’s extensive career. While I sincerely hope they get the finance to make the film, it reminded me that I still haven’t put enough energy into trying to place my collection recently. Sometimes I despair that, despite the fact that I have a dedicated website http://www.puppethouse.co.uk, have ploughed both time and money into making films for youtube and continued to pay for their storage unit, they still don’t have permanent display space. I was only thinking about all this so much because I had a bad cold and was staying in bed feeling pathetic and sipping Lemsips. But, as luck would have it, I also kept remembering things about my puppet history that haven’t been recorded, so I thought I may as well blog them. I’ll be glad when this cold is over! …..it was in the late 40s, my parents converted two rooms in our house in Highgate into a theatre, it had 30 red plush tip up seats bought from a local cinema. Our shows took place on Sundays and were often attended by local writers and the arts fraternity. I’ll remind people who have not checked our puppet site out that in the 50s our family staged huge marionette musicals in theatre on the North Pier in Blackpool. This show then moved to The Spa, Scarborough the following year, at 15 I was expected to run this second enterprise. The family met in Harrogate on Sundays to discuss how business was doing. When winter approached, it was back down to London to make a new show for Blackpool and so it continued for three or four years, a triangle of enterprise. …the kind of preparation that took place. There was also the ritual every spring, when my father dressed in his one and only suit, went down to see our local friendly bank manager. Having secured a temporary overdraft with a the shake of the hand, we then spent our time working to prepare the new show. Marionettes in my view are nothing, unless they can move and I am the only person left in our family who can still operate them and at least my films are on youtube. A few highlights from our Puppet Circus. Although we knew Percy Press (well known P&J man) quite well and later met his son, my parents never did Punch and Judy. However Paul my youngest son, has always had an interest and now does this own show. I did carve a Punch head about ten years ago, life intervened, so we purchased the booth and characters from John Styles three or four years ago. The show that follows was part of an entertainment weekend to launch the new theatre space on the terraces in Rottingdean last year. 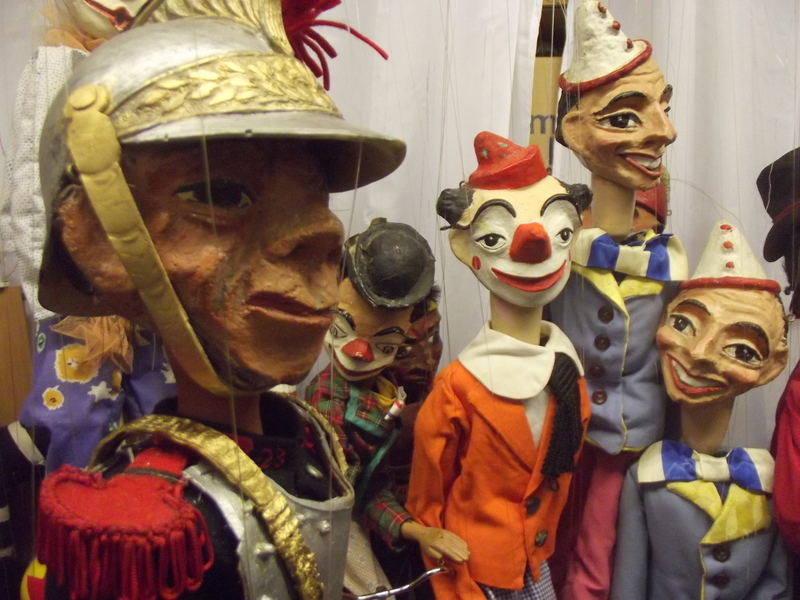 I took a few marionettes out to perform at the Rottingdean Fair in 2011 but the dolls were not impressed! Plonked on the grass between the barbecues and the potted plants, they didn’t feel it had the same ring as being in cabaret at The Cafe Royal. Posh puppets below! We had very modest means living in my grandparents house and although we paid rent to the old folk (I still have the rent book) my mother, being the youngest ended up nursing both of the old folk while they still tried to maintain their business. When we started and no backing at all from anyone, something that later in life my father prided himself on. Luckily for us however every season was a success, the overdraft was settled and we could survive the winter with children’s entertainment. Once or twice we were employed to perform a pantomime, but more often than not we managed to survive by performing at private parties, writing and publishing puppet plays and unusual project sometimes came about e.g my first solo performance was bringing stories alive with Johnnie Morris of ‘Animal Magic’ fame, somewhere improbable, like Hackney Baths! Our marionette musicals were lavish for the 50s. We had a huge theatre with stage lighting, a professional stage manager and at least four puppeteers. We made the marionettes, constructed theatres , devised productions, rehearsed endlessly as well as marketing and printing our own programmes, travelling and finding digs or renting a flat. As we expanded we either had to train people to be puppeteers or employ fellow puppeteers, then pray for a sunny holiday season with people willing to spend their money. Our shows were well supported, due to the tradition of wakes weeks, when the mills closed for two weeks and everyone went on holiday together. Miners and their families from Wales came to Blackpool too. Scarborough considered itself a bit more upmarket, but workers from the North would enjoy a good seaside holiday there too. It was much later than southerners would discover the joys of northern seaside resorts sometimes lured to Blackpool for the famous illuminations. It was fatal to appear on television with a popular stage puppet act, once it had been on the box, that was it! All those years of building a routine. gone in minutes. Some famous comediennes of my acquaintance, wisely shunned appearing on TV. We were never really part of the closer knit puppetry fraternity and from what I can remember it was not always supportive – there were internal politics, rivalry and even jealousy at times. But I remember our family had a long term friendships with Jan Bussell, John Wright and Bob Pelham, the toy maker who created Pelham Puppets. Nevertheless my parents enjoyed the honour of being the only puppet company to entertain Her Majesty the Queen, Prince Charles and Princess Anne at the Queen’s first party after the war at Buckingham Palace. However my parents were politely requested to avoid creating any publicity. I can’t remember exactly why, but there was a good reason. Our agent never forgave us for agreeing to the request she felt it would have made our careers! My father however was proud enough to use it on all our subsequent publicity. We entertained many celebs of the day at their private parties and did the first TV commercials featuring puppets.We made the pied piper for Pye Radio and Mr Lucas for the electrical company. Later we made and operated the puppets for a backing number for Cliff Richard on a TV spectacular and, of course, the marionettes in ‘Oh What a Lovely War’ (in storage) and we were the original puppeteers for the Telegoon Series. Many people envy such an interesting childhood, but it was what is known as ‘hard graft’. We were journeymen puppeteers, no fame and certainly no fortune! , Bognor Our pantomime puppets. My mother and I moved into cabaret but with each with different marionettes. My mother loved her ’Rose Murphy Marionette’ while I preferred one of my characters ‘Misty’ who changed her name to Cindy Brown in the 80’s. Being creative is just tiring. 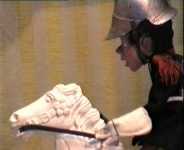 I really want to get on with my poetry, but this week have been trying to rescue a piece of armour from one of the marionettes from ‘Oh What a Lovely War’. It’s taking ages working out the best of way of doing it. At times like this I miss my mother, she would have known what to do in no time. But it still seems important I try and keep them all in good order, for some unknown and probably unappreciated posterity! At least only a handful of our marionettes where made of rubber, so escaped the fate of the Telegoons. All of the Telegoons were made of made of rubber, not by us I hasten to add. because they all them disintegrated over the years. Neddie Seegoon, the wonderful Bluebottle, Minnie etc just wire frames! Sort of puppet skeletons I quess. Apparently we were too expensive at the time, so we just got the contract for make the pilot film and the proto-type of the hands and the boots. Lucky old Eccles at least his spare pair are kicking around, I last saw them on our Humpty Dumpty marionette. -Just noticed that the Goon Show Preservation Society mag. had a photo of two people alongside ‘Eccles’, not that he got any credit for hanging around, just some comment about him hanging over a clock and everything being late? Not sure about that exactly… didn’t have time to read in detail …but just shows people think of my marionette as ‘Eccles.’ Perhaps I can auction him at Sotherby’s in my old age! Suddenly took it into my head to clear out some of the puppets and sell them for the Poppy Day appeal. Put a DVD of some of our plays with each one and put them up on Ebay. Sold six in quick succession. my mother, who was in London during most of the second world war was always moved to tears on remembrance day, so she would have approved. Thank you bidders! Not a lot else on the puppet front been too busy trying to be a poet in recent weeks and cleaning the oven, takes it out of you! Trying to adapt an old script about the environment, all about a small field with leaky pond, in the new venue – our new allotment. Here we are the owners of a plot with a second hand shed and some new raised beds. Maybe a new film is in the offing! Plays for Pelham Puppets – Everyone who likes Pelhams loves our Caterpillar Capers on You tube but I thought the interest in our play book and DVD had disappeared. But suddenly the demand has returned so much so I am about to edit the DVD for book two. Watch this space. There was a list of celebrities most likely to be there: Graham Stark, John Antrobus, Joe McGrath, Sandra Caron, Burt Kwouk, Sally & Jane Grafton (children of Jimmy Grafton), Marcel Stellman and Eric Sykes who it was hoped will unveil the commemorative plaque. The Goon Show Preservation Society under the enthusiastic guidance of John Respech the chairman and secretary Tina Hammond had raised funds to put up a plaque to commemorate the pub where the Goons first started to write their scripts. What a wonderful walk down memory lane the event proved to be. The pub was full of Goon related celebrities, including Charles Chilton, writer of many things including ‘Journey in Space’ and ‘Oh What a lovely War’. It was Charles who gave Spike his first break in show business at the Palladium. Marcel Stellman and his wife were also honoured guests.Marcel was responsible for producing many of the Goon songs, especially the world famous ‘Ying Tong Song’. Bert Kwouk, who worked with Peter Sellars in the film ‘The Pink Panther’, attended among many others… Of course my lookalike Eccles made for a Goon Show convention insisted on travelling to London to enjoy the fun. After the unveiling of the plaque leading actors of the day performed the first Goon Show script, generously donating their time, enthusiasm and completely without rehearsal. The wonderful Dave Withall, Peter Stanford, Phil Ladd, Jon Glover, Jeffrey Holland and not forgetting the lovely Les Drew on sound effects! A huge success of course, followed by the buffet and anecdotes from the celebrities. We also had the pleasure of the company of the writer Brad Ashton from London Associated Scripts. It is sad to note, however, that as the years go by there are less and less of these fascinating people at such events and that some of the younger people present had apparently learned of the Goons though the Telegoons. Graham Stark, who is an old buddy from my first summer season in Eastbourne sent his apologies as did Eric Sykes. Robin and Paul my sons managed to win two raffle prizes, a bottle of Scotch and a wonderful CD donated by Marcel, lucky them! Eccles disgraced himself unfortunately by insisting on being photographed unveiling the plaque when in fact Charles had performed the honour.. “Doh” said Eccles! Robin operated Eccles, when we did a Goon Show convention performance a few years ago. The Goon Show Preservation Society, is a still a thriving group. press on this link to see for the 60th Anniversary on youtube. Ann’s effort for their convention a few years ago, thrown together as Ann had just done a talk, was out of breath and can’t sing anyway. Robin who had never operated a marionette or sung before in public. So pretty good really. May 2011 Misty is wondering whether to persevere with her blog, no one has read it, ever! This could be because more popular marionettes are busy being ‘luvvies’ on youtube or Stratford! April 2011 Puppethouse which actually means me and some extremely unhelpful marionettes…have been busy organising a green screen to modernise some of our film material. Soon we will have marionettes appearing all over the place. for those who don’t know, they use the green screen for weather forecasts. It is where the presenter stands in front of a giant globe and some such wonders….our use however will be far more interesting! This whole idea is not as easy as it sounds as it has meant changing from Adobe 6.5 to Studio 12 and as my computer skills have all been ‘another mountain to climb’ the thought, never mind the action has taken months. Never mind new things will develop! and Marian Philips left, who writes short stories kindly agreed to read the script and and the children performed with the marionettes for an enthusiastic audience. 15 Feb 2011 Saltdean Library This week the children tried out rod puppets and created their own version of the play ‘Jack and the Beanstalk’. The local paper came to take a picture (look out for a special picture in The Argus) and Saltdean Residents Association brought down a cheque for a puppet theatre, formally presenting it to the Librarian. We are holding a play making competition for children aged 5 to 12, living in Saltdean, Rottingdean or Peacehaven. All you need to do is to outline a play using any of the following characters: boy, mother, king, queen. wizard, witch, princess, prince, fairy, giant, giant’s wife, Neptune, seagull, brown bird, cat, white rabbit, cow. Some of these characters are in the picture above. You can have props that are easily made: fish, butterfly, box, net etc. It should be no more than two sides of A4 and can be dictated to an adult if necessary. Entries must be given into the Library by 12 midday 12th March which is the day of the next workshop. Entry forms from Saltdean Library or from Sam owner of the greengrocers in Lustrells or from The Open Arts Cafe in Rottingdean or email me ann@puppethouse.co.uk and I’ll send an attachment. Judges are: Janet Cameron (writer) Marian Philips (writer) and me. Prizes donated by Puppethouse will include one ten pound book token, and three Pelham Puppet Play books with a DVD. Have fun, Ann Paul Perrin took the photos on this page. Nicky Perrin helped to make the puppets. The last workshop in this series is on 9th April. However the Library intends to continue with puppets on a regular basis. .
We are hoping to get a permanent display space for our marionettes. Interested parties please note! However ‘Puppethouse’ has also been very happy to donate time and expertise to run a series on Puppet Workshops in the Library, in order to support their community involvement. 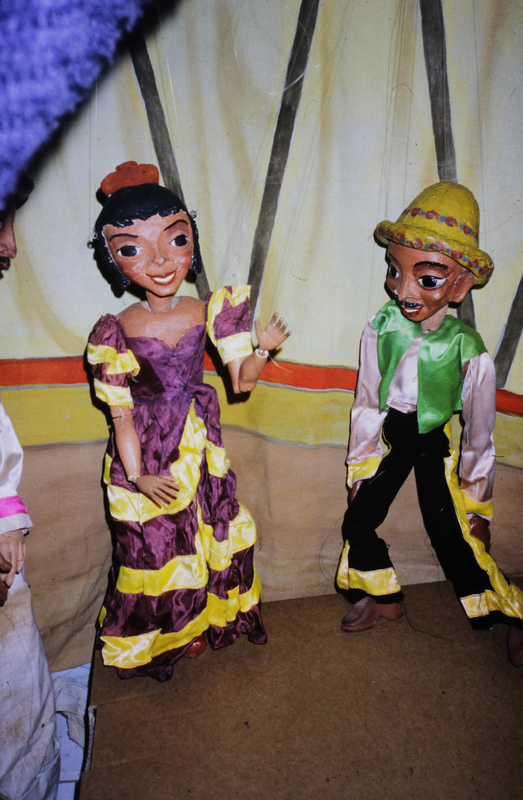 Displays: December – A display of marionettes from Cinderella. 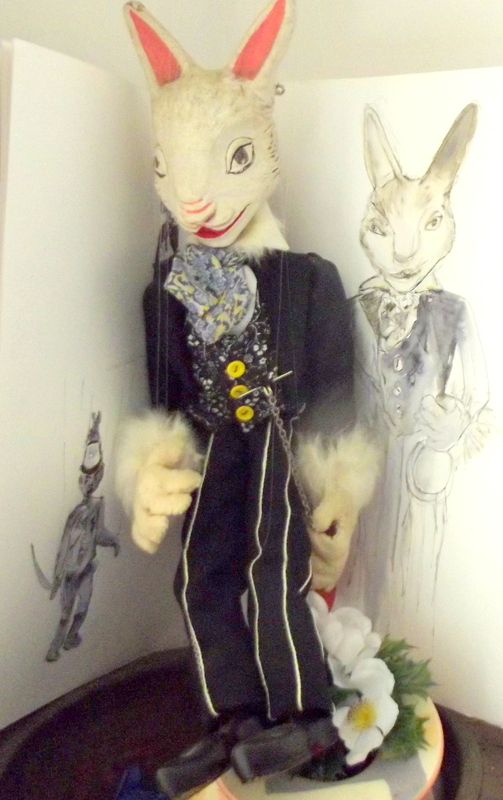 January – A display of marionettes from Alice in Wonderland. Workshops: December Workshop– The Rod Puppet Workshops were a great success. Photos of the children are on display in the Library. Both parents and children enjoyed making a wonderful range of characters, we hope they will feature in plays written by the children in future sessions. 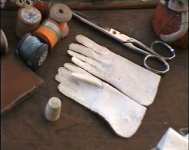 February 12th – A demonstration on how to operate glove, rod puppets and how to operate a marionette. We and we also attempt producing ‘Jack and Beanstalk with rod puppets in two hours flat! Come ready to help create a beanstalk. We also hope to launch a play writing competition in the near future. March – Making plays and playing with ‘Pelham Puppets’ which are those wonderful toy marionettes popular in the early 60s Feel free to bring your own puppets. 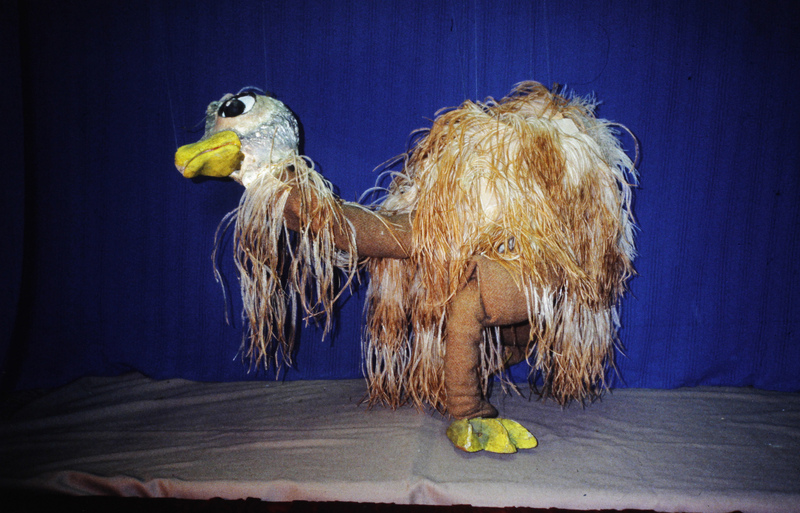 Puppetry – social history Our puppethouse site was developed by my youngest son Paul Perrin over 15 years ago when such sites were rare – link at the end of this page. Sadly, I know we are seldom, if ever, mentioned by those involved in puppet history and its publications. But at least I can sing our praises on line! The film I am most proud to have made was one with my mother eight years before she died ‘The story of our magical marionettes’. We usually included small extracts from ’Alice in Wonderland’ in our marionette musicals, particularly in both Blackpool and Scarborough in the 50s and 60s. In those days there were ‘wakes weeks’ when factories and mills closed and the workers had their annual holidays. The film that follows is based on different scenes that we would have used in our shows. The filming took forever…I had had to learn filming and editing skills. Filmed in London, partly in my garden and partly in my loft. My mother clambered up the ladder to the loft well into her seventies. It all became a chance to create something new out of the chaos of all of our lives. We both regarded it as a labour of love. Re-creating the Puppet Circus was another marathon, no crew, just my mother and I. Unfortunately it has none of the repartee of the clowns. Although I have recently found an audio tape of one of their performances. Listening to my parents’ voices from the 60s would have been one step too far anyway. I may have to leave that to my grandchildren! http://www.youtube.com/user/puppethouseuk to see all our puppethouse films including, slide shows, our puppet circus that went to Buckingham Palace and Ann’s talk about marionette manipulation as part of a module for a University course at Egham. The Puppethouse Museum with some information we have found more recently. Ann: This was such a fascinating and enjoyable read, and brought back cherished memories of the Egham Goon convention, which those of us (unlike poor Eccles) having more than one brain cell may remember was attended by not only by Eccles 2 assisted by Robin, but also you, John Dudley, Violet Philpot, and Mike Fox, not to mention ‘thousands’ of adoring Goon fans. BTW, I have a phone number and address for none other than Wendy Danielli, who now lives in Wales. I have not tried to make contact yet, but thought perhaps you might like the honour? Let me know. Same old email address (see below). I would live to hear from you.